The first and most unmistakable sign that a team has a full-fledged QB controversy on its hands is when its coach denies there’s a controversy. 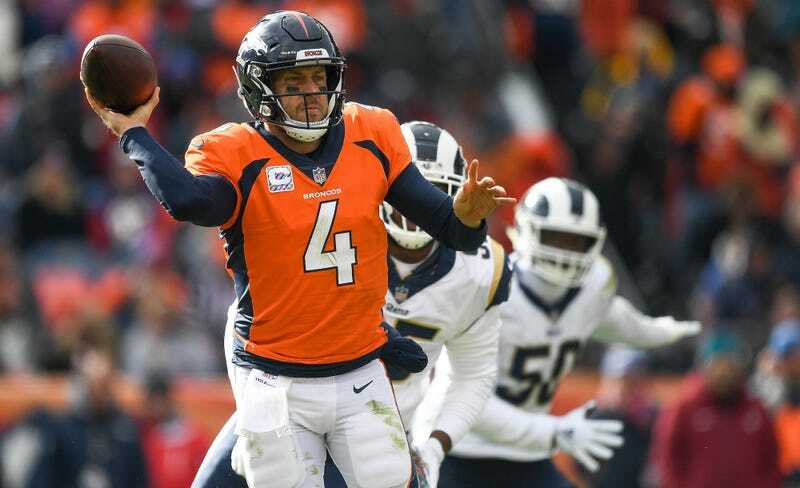 “Case is our quarterback,” said Broncos coach Vance Joseph, which means that Case Keenum may not be Denver’s quarterback for all that long. Keenum was again jeered when he returned to start the second half. Keenum actually had one of his better games on Sunday, completing 25 of 41 passes for 322 yards, with two touchdowns and an interception. But there were some really ugly moments, with Keenum often chucking the ball over his receivers’ heads, or failing to throw it altogether. Among the 34 NFL quarterbacks with enough attempts to qualify, Keenum ranks 21st in yards per attempt, 28th in passer rating, 29th in total QBR, and is tied for the league lead in interceptions, with eight picks against just seven touchdowns. The Broncos were not expecting Keenum, a career journeyman backup, to repeat his MVP-level 2017 (or at least should not have expected it), but so far he hasn’t even really offered “game manager” levels of competence. The calls for Chad Kelly have little to do with fans’ actual hopes for Kelly—the Mr. Irrelevant of the 2017 draft who beat out Paxton Lynch for the backup job this summer—and more to do with the fact that he’s not Keenum. But the Broncos don’t really have a plan right now. Keenum’s signed for one more season after this, with an out in this coming offseason, so he’s merely a bridge quarterback. But, a bridge to what? At 2-4, there’s no longer much downside to seeing if Kelly has NFL stuff, or if the QB position will have to be addressed yet again, in the draft or in free agency. John Elway has already started scouting college QBs. As the Broncos’ inability to find a quarterback is going on four years now, the GM needs to start showing something too.